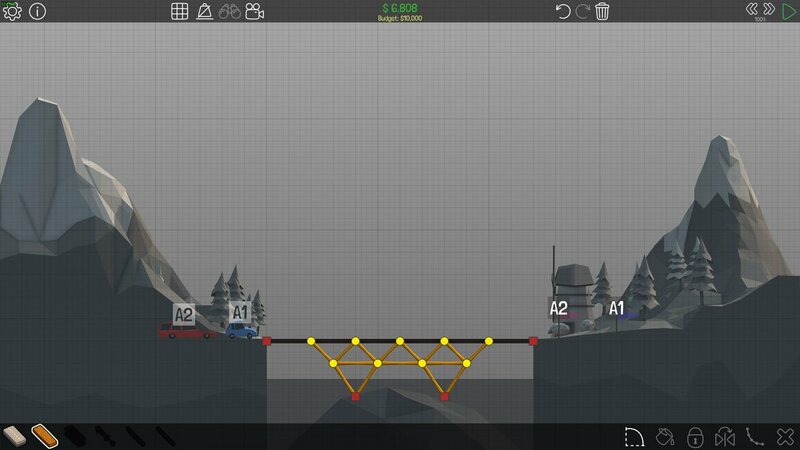 In this guide, or walkthrough, we’ll show you how to complete the first 15 Levels of Poly Bridge, all under budget! These are just methods that I used personally, and there are possibly better methods around. However all the guides below gets the job done. For each level, I’ve included the blueprint shot to show how to build it, a short description as well as a screenshot of the simulation in action. 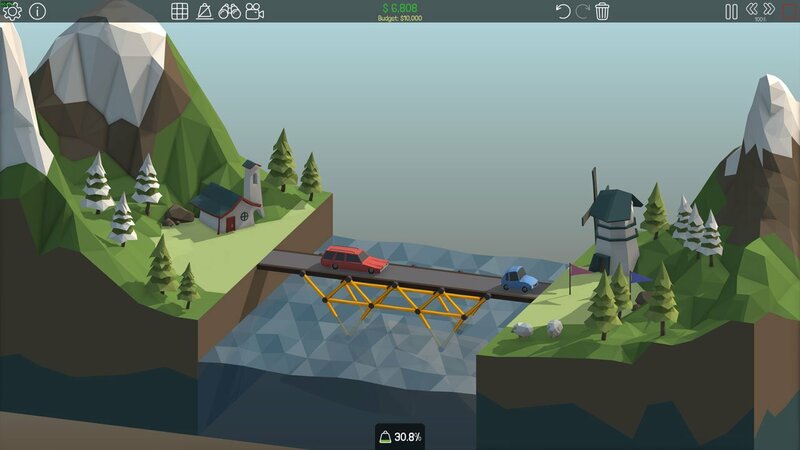 View Poly Bridge on Steam. 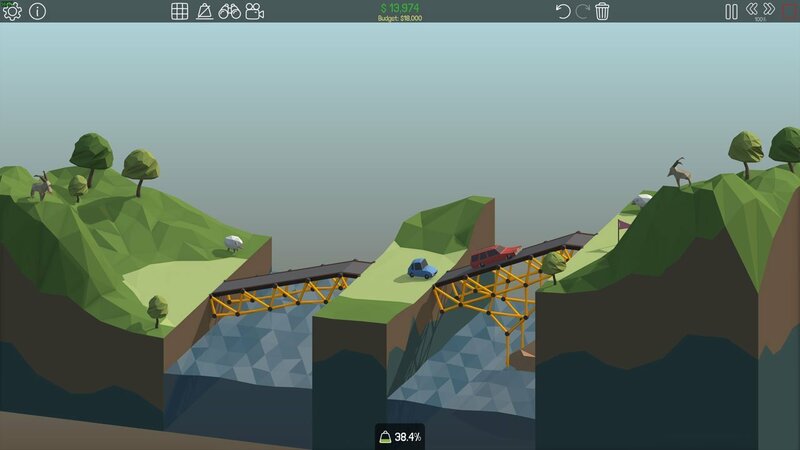 For your very first level in Poly Bridge, you’ll have to create a simple bridge. Follow the blueprints above to create a strong bridge which is way under budget. Use wood planks to solidify the structure, and ensure to connect all pieces as shown above. 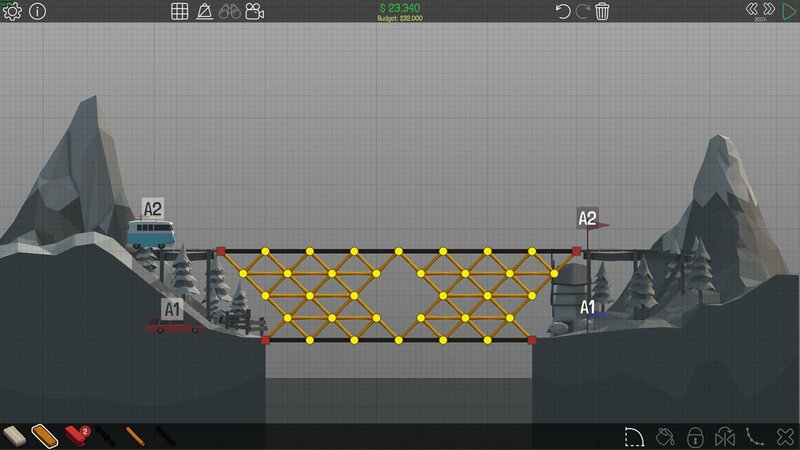 Similar to the first Level, in 1-2, we’re going to create a slightly longer bridge. It’s still easy to create, just use the blueprints above. Connect a piece of wood between the rock in the centre and your bridge to create a solid structure. You’ll also have 2 vehicles cross over this time. 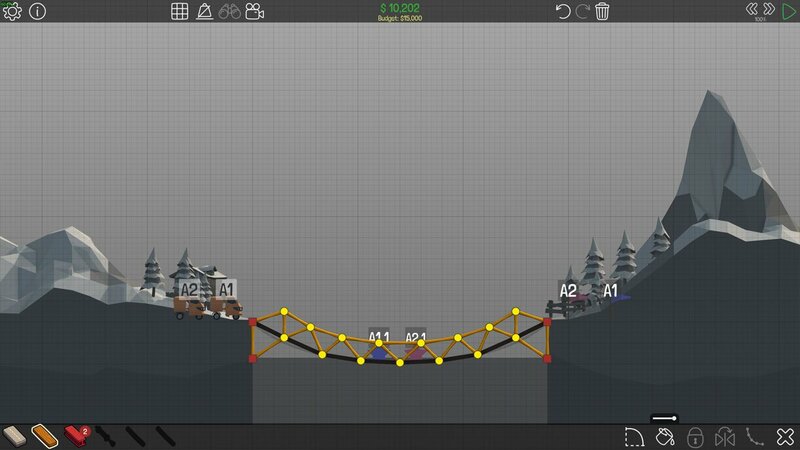 For the final Simple Bridge, it’s going to be slightly larger once again. Use the diagram above to replicate my design. 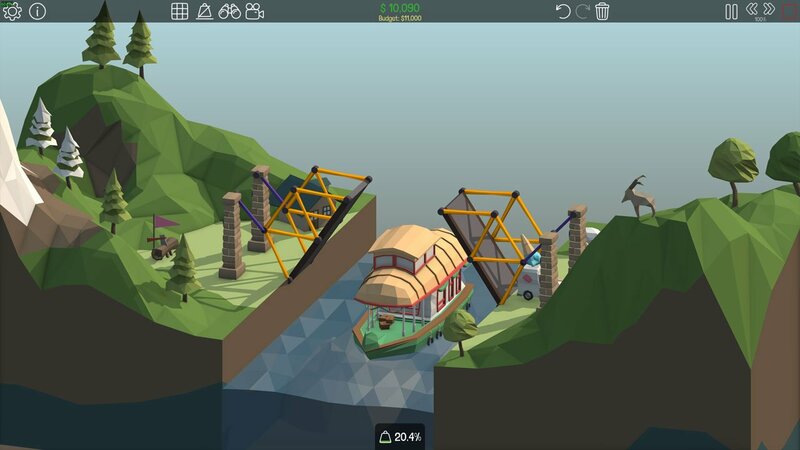 This time, you are given two connection points at the bottom, which you can use to strengthen the bridge and ensure that it doesn’t collapse. Steering away from the simple bridges now, we get our first bridge which we may have to think about. 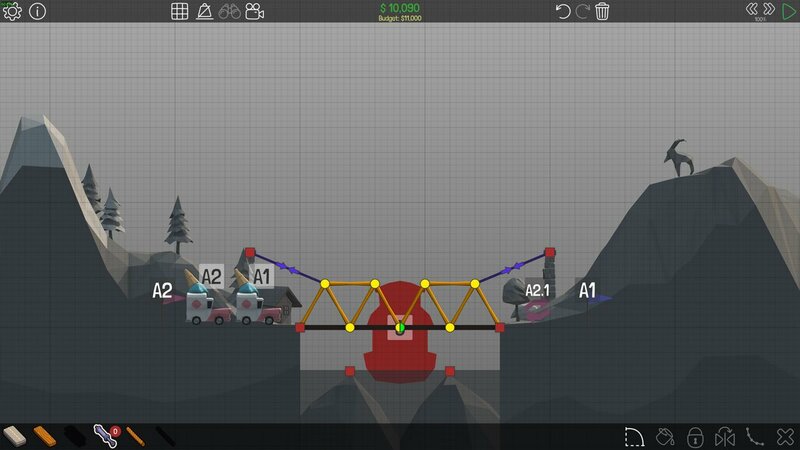 For 1-4, we’ll need to create a slanted bridge to reach the final point. Just connect the points with roads, and strengthen the bridge using wooden planks in a triangle formation on top. 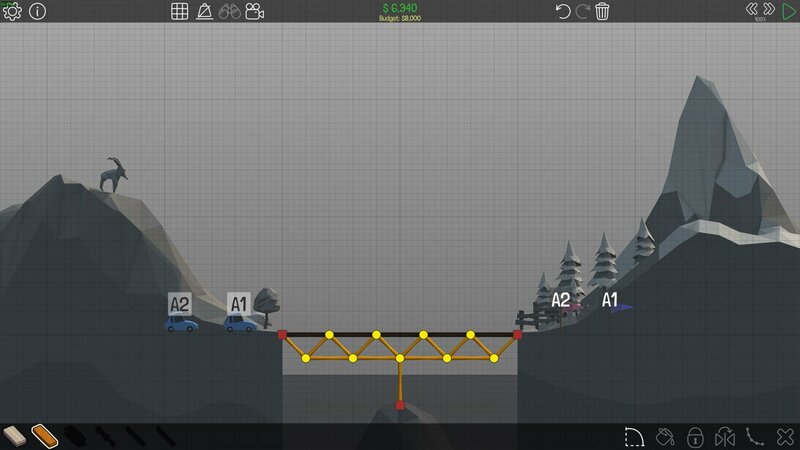 In 1-5, it’s time to create two separate bridges. Thankfully, this one isn’t too difficult. If a ramp is too steep, larger vehicles such as vans won’t be able to make it up. 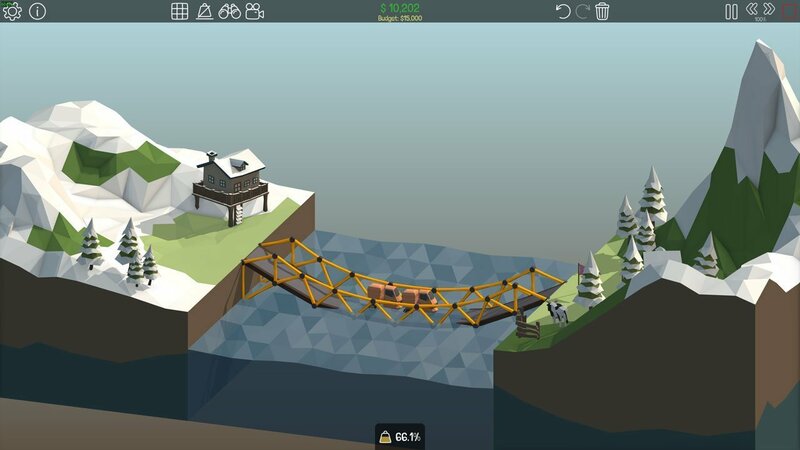 I’ve also placed pieces of wood to the far left and right of each bridge, so if it is pressed down it will just collide with the wall and hold it up. 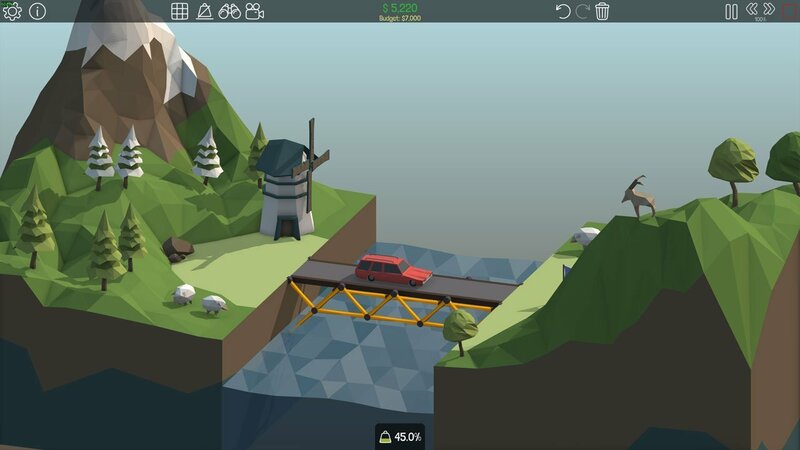 Now this is the first level we’re obstacles will start showing up, in this case a boat. We need to build a ramp bridge high enough to where it goes over the bridge. 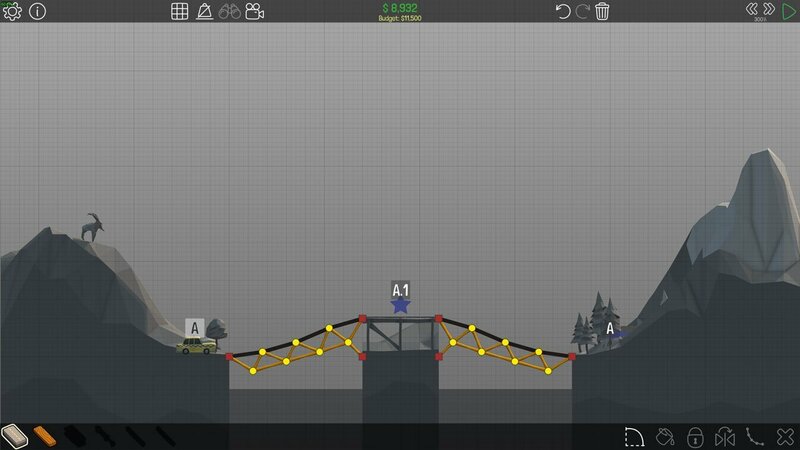 This one can be quite tricky, as the bridge will just collapse if it doesn’t have enough support. If any part of the bridge are in contact with the boat, it will get destroyed too. This time, we won’t be building a complete bridge. 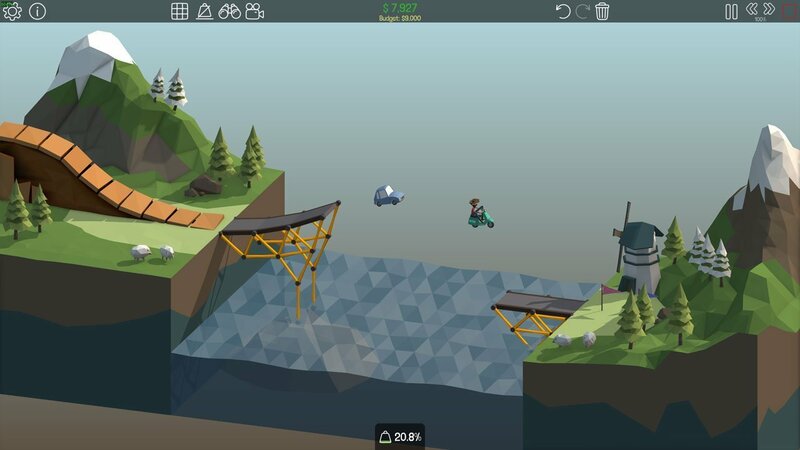 You’ll need to build a ‘jump’ for the cars to fly over the gap. 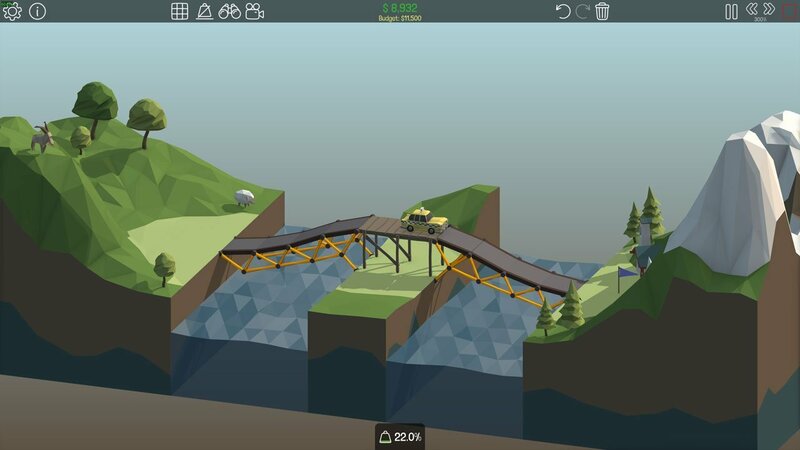 You’re limited to the amount of road pieces you can build anyway, so building a bridge and trying to cheat on this one is impossible. 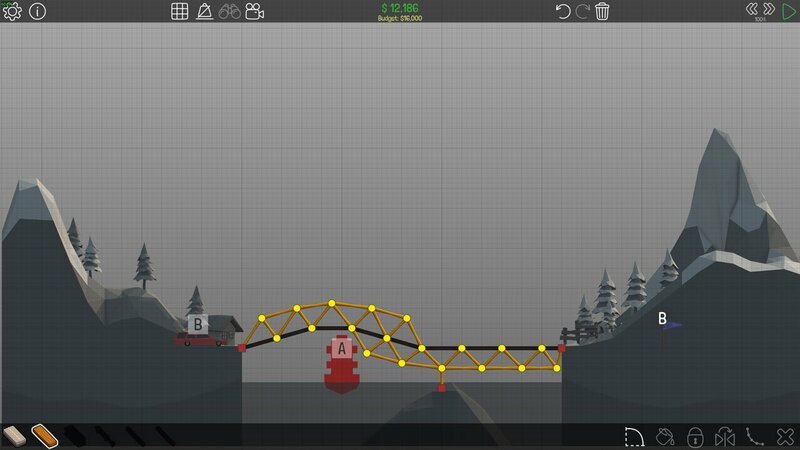 With these blueprints, the cars will land on the second part of the bridge, break it but still make it over. 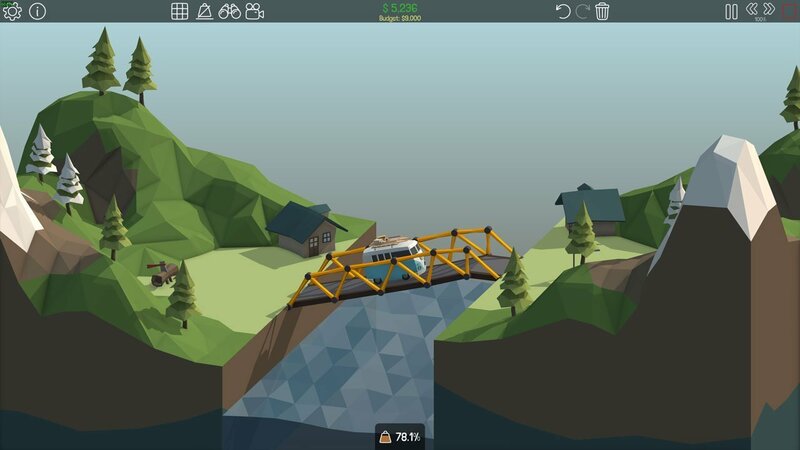 Again, we have a bridge that needs to allow a boat to pass under it. However this time, you’re given access to a new building material called Steel, which is much stronger than wood and can be built at greater lengths. Also included is rope, which can support bridge pieces and hold them up. 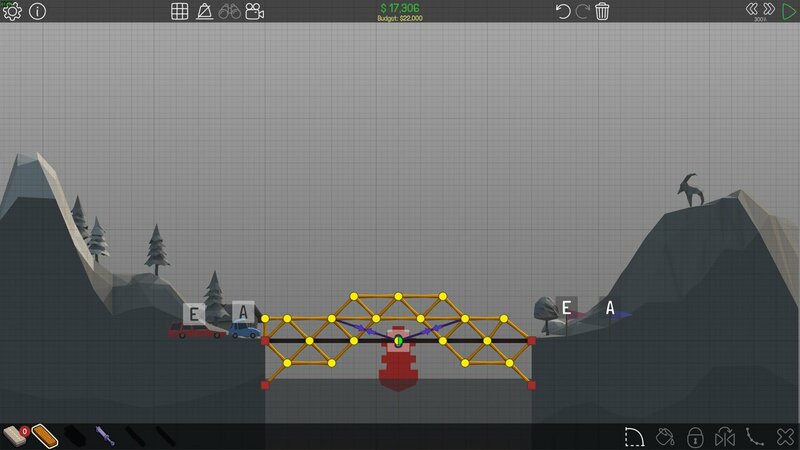 Follow the guide above to complete 1-8 in Poly Bridge. Make sure to connect the rope in the same way I have, which is from the top of the steel piece to the connection point, as well as to bridge pieces. In 1-9, introduced are hydraulic pieces. 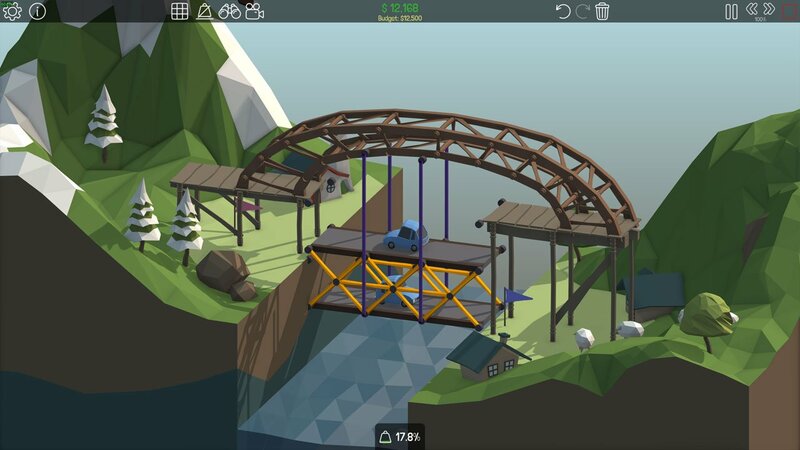 These allow you to create hydraulic bridges, which basically allow parts of the bridge to lift up to allow boats to pass through underneath. 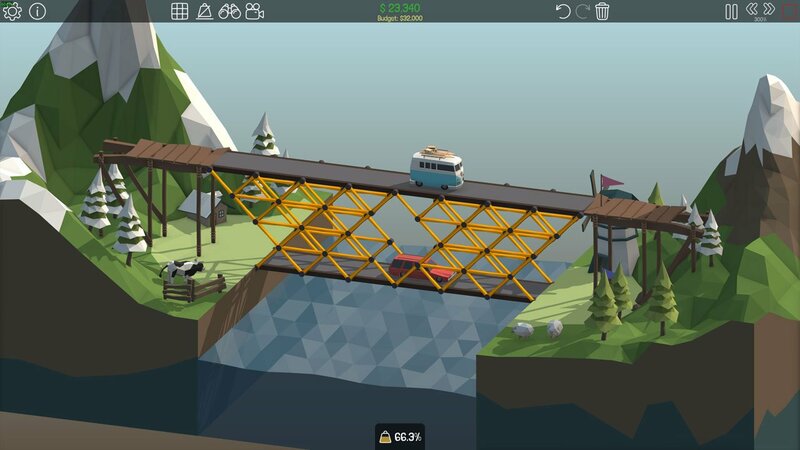 There hard to get used to at first, but Poly Bridge should provide some tips. 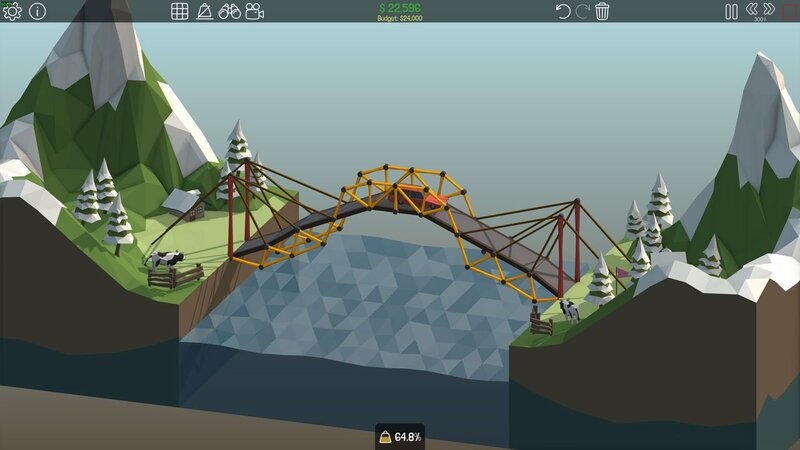 Make sure to double click the centre connection point to determine where the bridge detaches. In Checkpoint (1-10), you have to grab the checkpoint, which in this case is a star in the centre of the map. You won’t be able to complete a level without collecting any checkpoints inside of it. 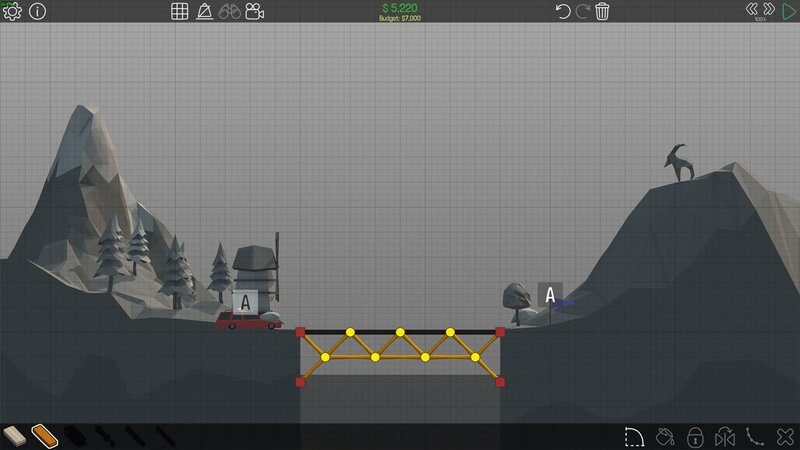 Copy my blueprints above to create a strong, under budget bridge. 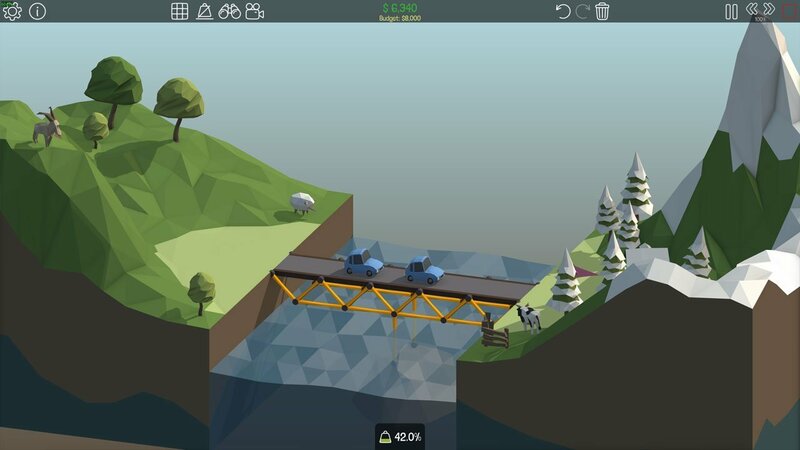 With this level being called Low Budget Bridge, you can guess what you’ve got to do. You only have a limited amount of cash to transport a heavy vehicle from one side of the bridge to another. Thankfully, it’s not difficult at all due to it being a straight line with no obstacles or checkpoints. 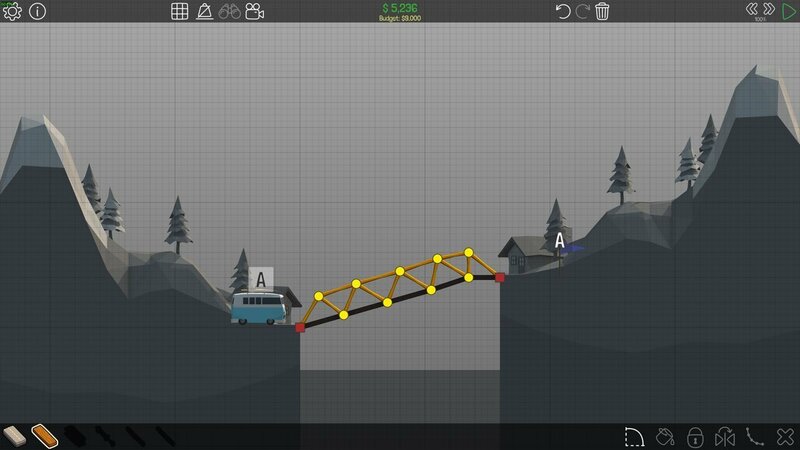 This Poly Bridge level can be a bit tricky, and there are many ways to go about it. However if you want what is one of the easiest methods, just copy the guide above. 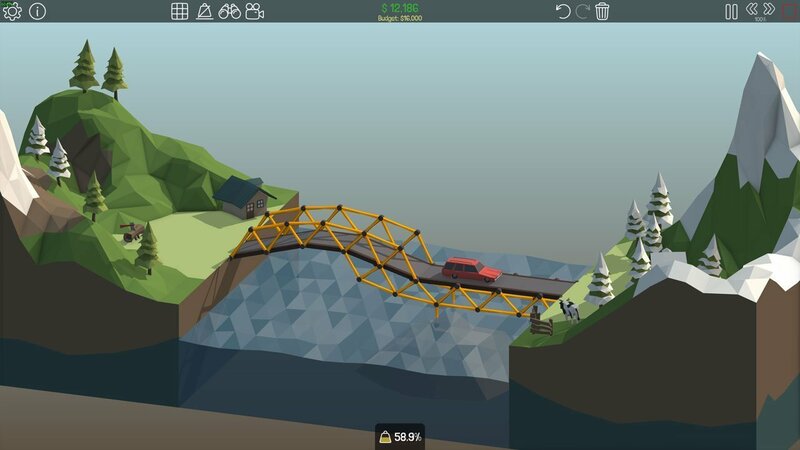 You can build half of the bridge, and use your shortcut keys such as C to copy, then F to flip it which will save a lot of time. 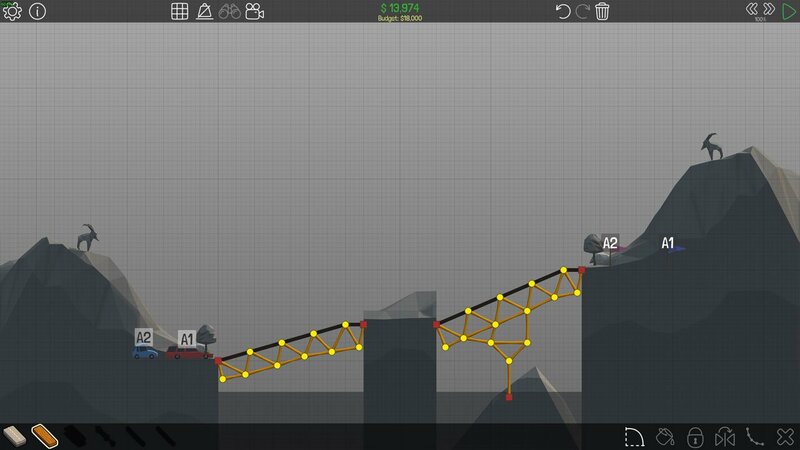 Getting a strong enough bridge for this level can be really difficult. 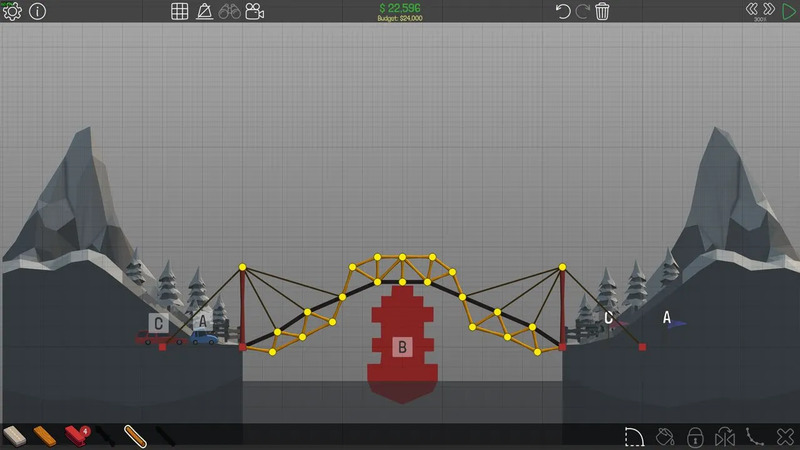 To create this bridge, I used the tools in the bottom right to create a slanted bridge, and adjusted the connection points to strengthen the bridge more. 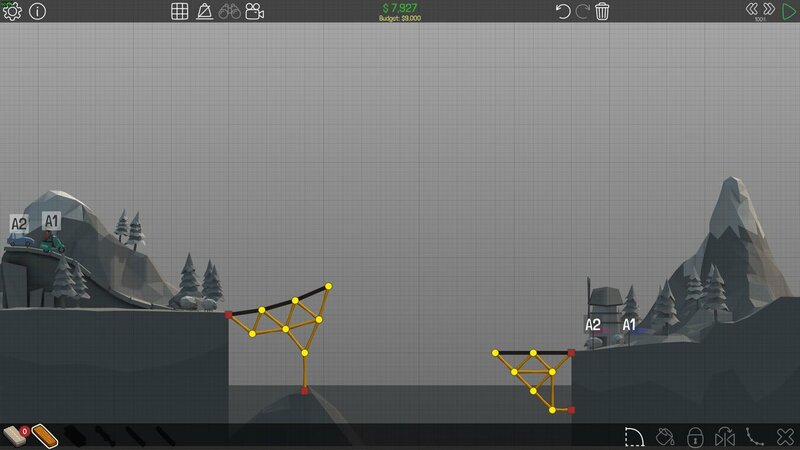 Completing this level will take a lot of trial and error. This time we’ll be creating another hydraulic bridge. 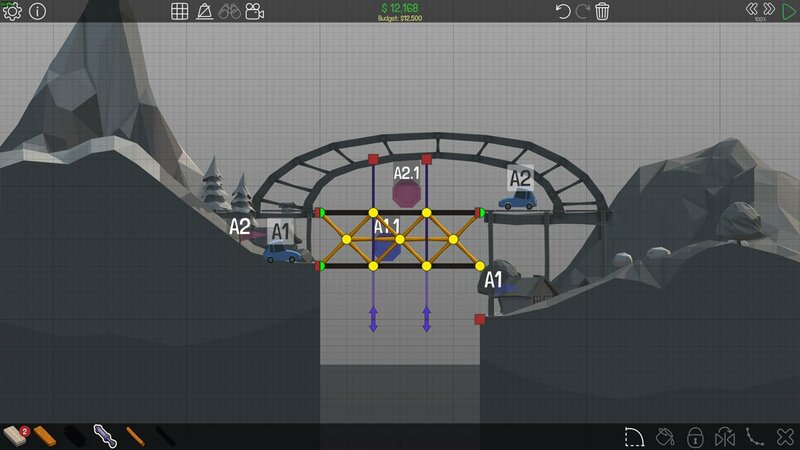 1-14 seems difficult at first, but copy the image above into your own Poly Bridge game and you’ll have it completed in no time. 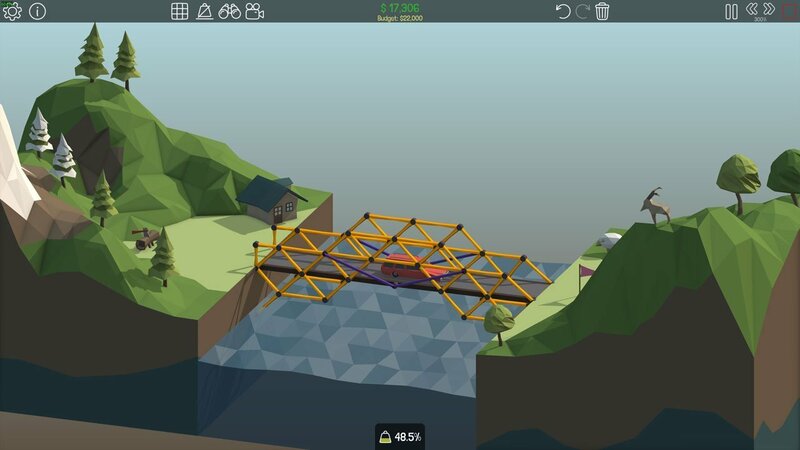 Make sure to double tap the connection point in the centre so that the bridge will lift up. We’re now on the final level for Alpine Meadows, 1-15. What a stressful ride it’s been so far. 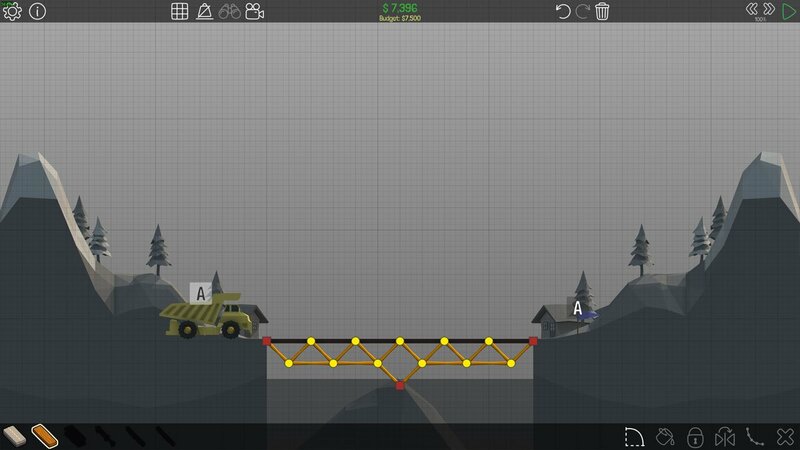 Anyhow, for this level we’re going to create a simple elevator mechanism which will load both vehicles, and then take them to the correct level. Just copy the diagram above. Make sure to drag the arrows on the hydraulics all the way down.